... Polyethylenephthalate (PET) under brand 'ROSPET' is manufactured at New Polymers Plant 'Senege'. Polyethylenephthalate (PET) under brand 'ROSPET' is manufactured at New Polymers Plant 'Senege'. PET production was first launched in 1960-s by Dupont company. Production in Russia started in the year 2003. Annually more that 10 million tons of PET is manufactured worldwide. Main production facilities are located in China, Korea, East-Asia countries, Western Europe, USA and Mexico. Estimated by the majority of market players the average price on PET in 2011 should be over USD 2000 per ton and the total PET consumption in Russian region – 600 KT. Thus, the annual gross sales would equal to USD 1.2 billion. 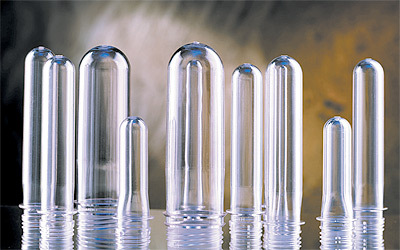 The specific feature of the Russian market is PET usage mainly for packaging. The market of PET packaging is quite new but it is dynamically growing. Production of PET bottles in Russia started in 1990-s, at that time total annual consumption of PET was about 20-30 KT per year. The increase of PET production in Russia leads to substitution of import, increasing the local oil processing which is a positive factor for the development of the national economy of Russia. The market experts expect the capacity of PET market in Russia to grow steadily by 5% per year. This is due to the constant increase of PET bottle production – the main consuming sector of PET in Russia which, in turn, results from increasing water, beverages, beer as well as milk and juice consumption. However, the consumption of PET per capita in Russia still remains 5 times lower than in Western Europe and 7 times lower than in USA.